This Mandatory Declassification Review contains two memorandums of conversation (memcons). The first memcon is between President Clinton and President Lech Walesa of Poland on April 21, 1993. 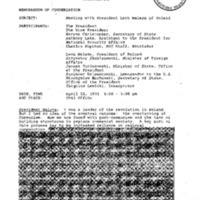 The second memcon is between President Clinton and President Vaclav Havel of the Czech Republic on April 20, 1993.